The main problem in this research is how the model of secondary education management in Central Java Province. Issues divided into a) what are the expectations of various parties regarding the transfer of secondary education management, b) how are the challenges of various parties related to the transfer of secondary education management, and c) which management model is most effective for managing secondary education in Central Java Province. This research is descriptive qualitative. Data collection through FGD was recorded with video and government policies related to secondary education. The number of informants is nine people. Research data is processed using qualitative research software, NVivo 11 Plus for Windows. The study was conducted over three months from October to December 2016. The results were a) some expectations: improving the quality of education, improving access and equity of education, improving teacher welfare and promoting professionalism. teacher; b) some of the challenges faced: the province will ignore the welfare of non-civil servant teachers and reduce the free education of secondary education; c) the most effective model is co-administration. It is recommended that the government immediately make government regulations on the management of secondary education. At the provincial level was directly made education policy. East Java provincial government has now chosen alternative "based region" in six regions of former residency in Central Java. This alternative needs to be tested for its effectiveness, if it is not effective then it is advisable to use co-administration. Aulia, Sitta. 2012. Desentralisasi Kebijakan Pendidikan (Studi Tentang Pelaksanaan Wajib Belajar 12 Tahun Di Kota Surabaya Pada Tingkat Pendidikan Menengah dan Kejuruan). Jurnal Politik Muda. 2 (1), 204-216. Drummond, H., 1993. Effective Decision Making: A Practical Guide for Management. London: Kogan Page Limited. Harrison, E.F., 1992, The Managerial Decision-Making Process. Boston: Houghton Miffin Company. Hoy, W.K dan Miskel, C.G. 2014. Administrasi Pendidikan: Teori, Riset, dan Praktik. Yogyakarta: Pustaka Pelajar (terjemahan). Instruksi Menteri Dalam Negeri Nomor 061/2911/SJ Tahun 2016 tentang Tindak Lanjut Peraturan Pemerintah Nomor 18 Tahun 2016 tentang Perangkat Daerah. Lestari, D. A. dan Susena, E., 2014. Analisis Pendidikan Gratis Di SMA – SMK Di Surakarta Menuju Pendidikan Indonesia Yang Berkeadilan. Jurnal Sainstech Politeknik Indonusa Surakarta. 1 (2), 1- 9. Peraturan Pemerintah Republik Indonesia Nomor 18 Tahun 2016 tentang Perangkat Daerah. Sumardjoko, B dan Prasetyo, A. 2016. Pengembangan Profesionalisme Guru SMA, MA, dan SMK Muhammadiyah Sukoharjo Jawa Tengah. Varia Pendidikan. 28 (1), 77-89. Surat Edaran Menteri Pendidikan dan Kebudayaan Nomor 6 Tahun 2016 tentang Pedoman Organisasi Perangkat Daerah Bidang Pendidi-kan Dan Kebudayaan. Suwandi, 2016. 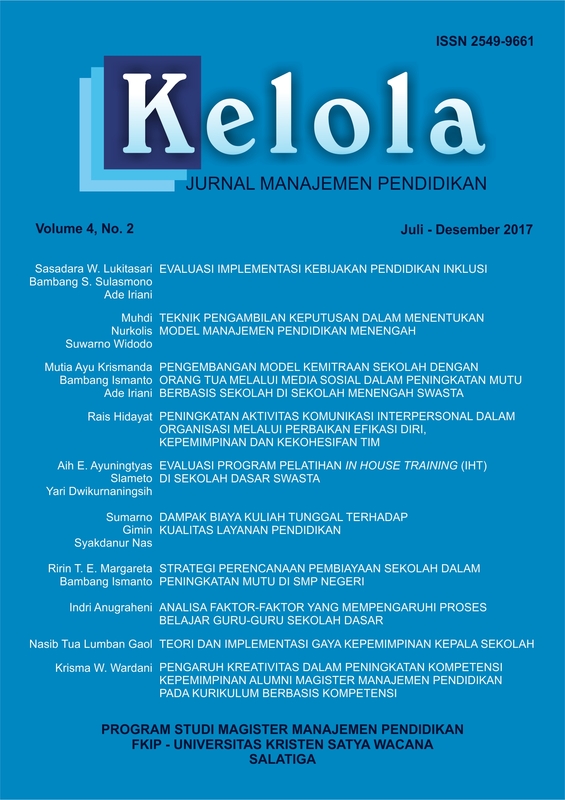 Analisis Studi Kebijakan Pengelolaan Guru SMK Dalam Rangka Peningkatan Mutu Pendidi-kan, Jurnal Ilmiah Pendidikan Teknologi dan Kejuruan . 23 (1), 90-100. Undang-Undang Republik Indonesia Nomor 22 Tahun 1999 tentang Pemerintahan Daerah.